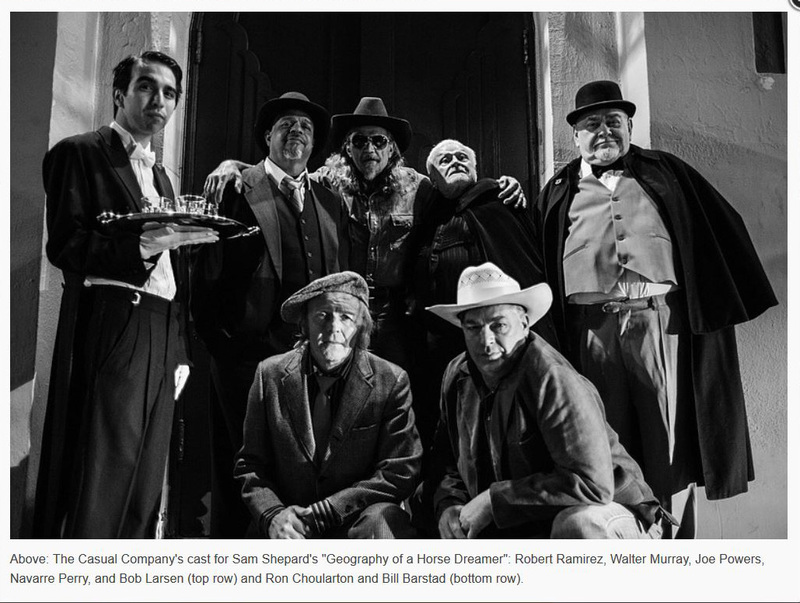 San Diego theatre group The Casual Company will present Sam's "Geography of a Horse Dreamer" as part of a month-long tribute called "Deep in Shepard Territory". The reason for doing this now is that it was in April 40 years ago that Sam won his Pulitzer Prize for "Buried Child." And the reason for picking "Horse Dreamer" for the full production was because it was a play that project director Joe Powers had done 27 years ago and he saw that it resonated in new ways now. Powers believes Sam had a gift for defining rural America. Powers explains, "It's the family's struggling to find their way through America and keep up with it, but at the same time not lose the essence that formed this country. 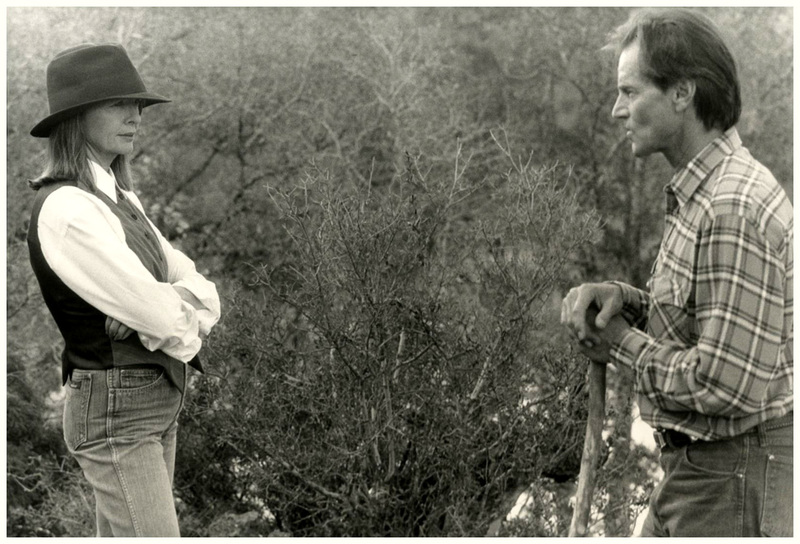 There's an immense amount of old West imagery in the Sam Shepard stuff. There is a connection to the land, a disconnection with family, and then there's a feeling of trying to reconnect and mostly I think it was visceral. There's a reality to it that's also enhanced by fantasy and taking it to the next level. And 'Horse Dreamer' pits a lot of archetypal characters against each other. Things like old cowboys, old gangsters. It's very American, very rural, very human, I think more than anything, it's very human. 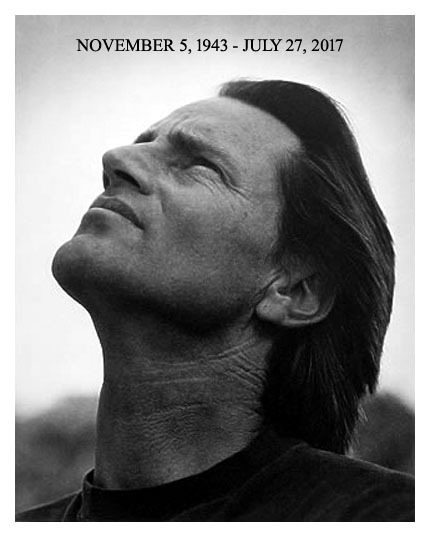 There's an immense poetry to his work. When you get deep in Shepard territory, that's where the poetry is. You get these monologues that are these people expressing their angst or expressing their love or expressing whatever it is they're expressing. And then all of a sudden it's just flowing and it's very, very poetic. But it is also just people talking and I think that's probably what Shepard does really, really well." Each evening after a performance, audience members will be asked to bring a one-to-three-minute piece from their favorite Shepard work and ask one of the actors to read it. In addition, there will be staged readings of "Buried Child" on April 16 and "Fool for Love" on April 22. "Deep in Shepard Territory" hopes to remind audiences of what Sam's legacy is. Performances begin April 5 at Tenth Avenue Arts Center. 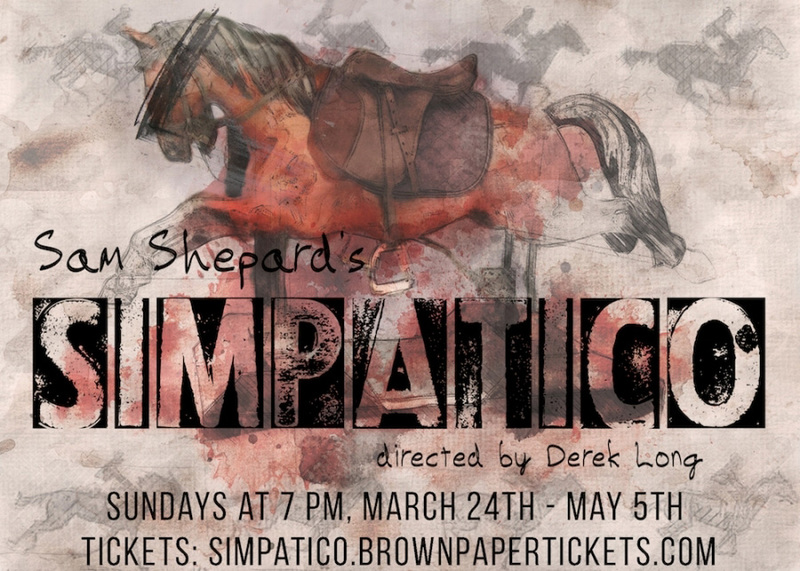 Also in California is the Preatorean LLC Productions' staging of "Simpatico", directed by Derek Long. First produced in New York 1994, the play is an American drama set in California and Kentucky. It is running through May 5 on Sundays at 8 pm at The Whitefire Theatre, 13500 Ventura Blvd, Sherman Oaks. Gorgeous poster! As a equestrian and horse breeder himself, Sam had a strong connection to horses and they inevitably show up in his books, several of his films, as well as on stage. In 2008, he attended the World Science Festival in NYC where he related this humorous story called "You Can Lead a Horse to Water". Presented with an innovative storytelling organization, The Moth, scientists, writers and esteemed artists tell on-stage stories about their personal relationship with science. In keeping with Moth tradition, each story must be true, and told without notes in ten minutes. The story that Sam relates is about the time he brought his personal horse to the set of "The Right Stuff". You can watch his performance at this link. 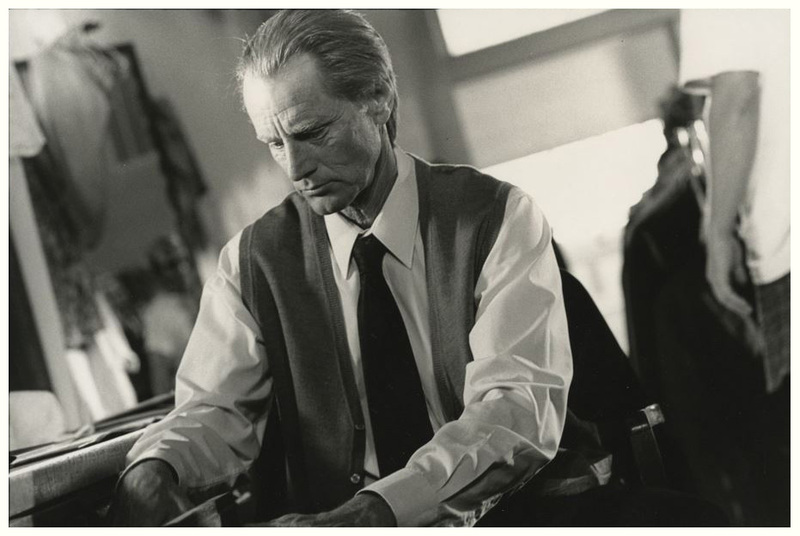 I recently came across these wonderful black & white photos from the 1997 film "The Only Thrill". 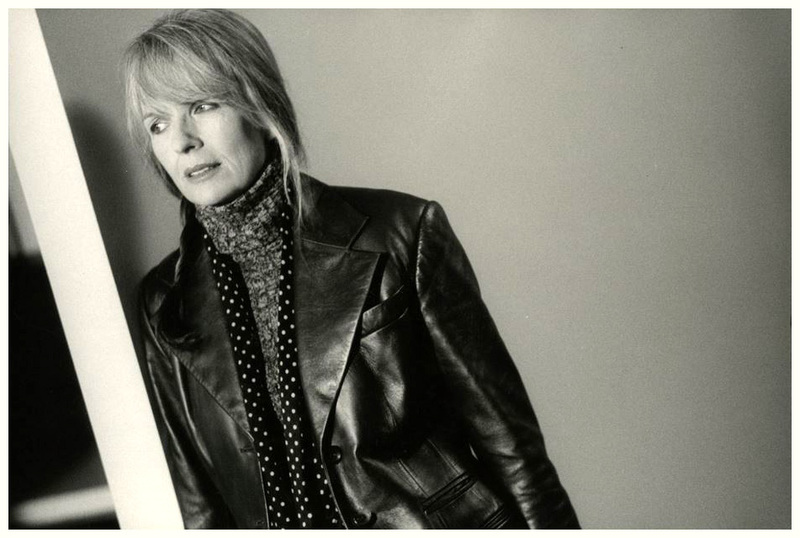 Sam's role as Reece McHenry is one of my favorites and he nails it with the help of Diane Keaton. 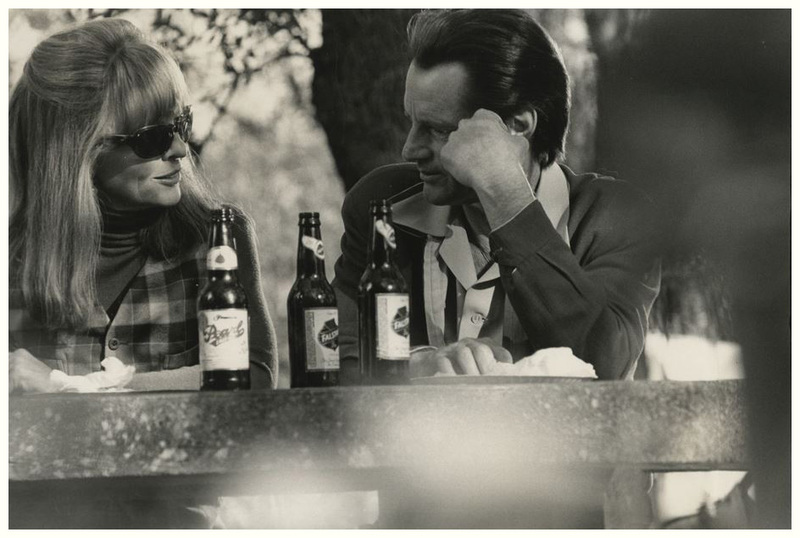 Kevin Thomas of the L.A. Times expresses my sentiments exactly - "The Only Thrill proves to be a poignant, contemplative drama about lost chances with luminous portrayals by a perfectly matched Diane Keaton and Sam Shepard, who were first teamed in 1987's Baby Boom... The chiseled, laconic Shepard is the actor of choice if you want reticence in spades, but he goes beyond that to show us a man shriveling up before our eyes, seeming to grow literally smaller... Frankly, it's hard to imagine the film working without Shepard, who can suggest so much that's knotted up behind a stoic facade. The Only Thrill offers him one of his most substantial screen roles, right up there with Volker Schlondorff's neglected 1991 Voyager." Here's an additional treat - a montage of several scenes created by an anonymous blogger. 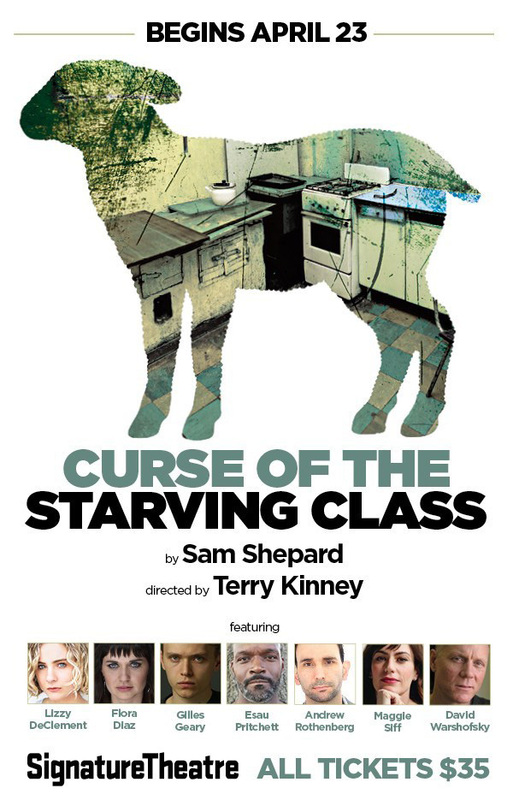 Casting is complete for the upcoming off-Broadway revival of the drama "Curse of the Starving Class". Tony nominee Terry Kinney will direct the production, which will begin previews on April 23 and open on May 13 at the Pershing Square Signature Center. Tickets are now on sale. Last produced by Signature more than 20 years ago, the play follows the Tate family, who are living a stagnant, unhappy existence in rural California and are desperate for a change. The production is scheduled to play a limited run through May 26. Before Sam died in 2017, he asked Ethan Hawke to star in the Broadway revival of "True West", stressing that he wanted the revival to be truer to the idea that the brothers are not interchangeable, as other productions have cast them as. According to Vulture, one of Hawke's preshow rituals includes a tribute to the playwright. Sam's first book was titled "Hawk Moon" and Hawke has a fake-ink crescent applied before every performance. "I think in his early 20s, he had a little hawk moon tattooed on his hand, a little green sliver of a moon. The first sliver of moon in November is sometimes called the hawk moon. I’ve always been fascinated by it because he writes about that moon which usually happens on his birthday, which is November 5. Mine is November 6," Hawke says. "There’s something about this play that feels directly distilled from his heart, his brain, and so I wear that tattoo for the run in a kind of homage to the playwright." 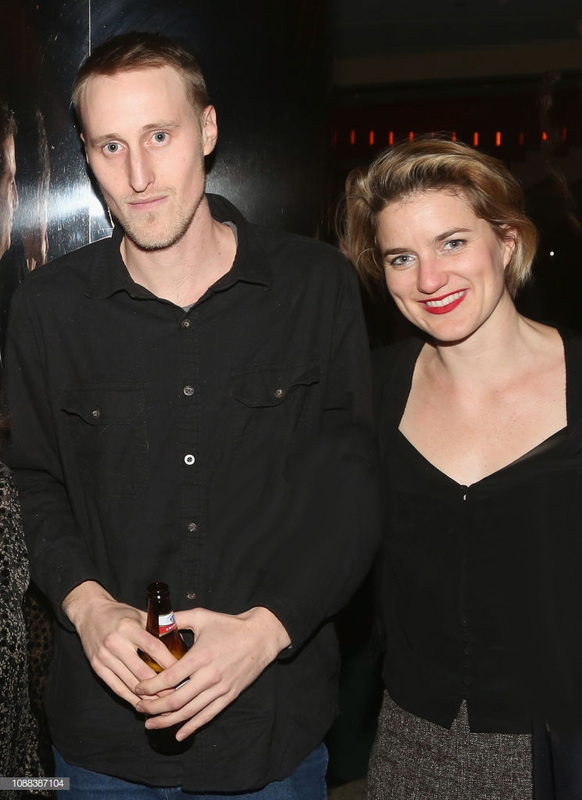 Attending the opening night after party on January 24th were Sam's children Hannah and Walker. 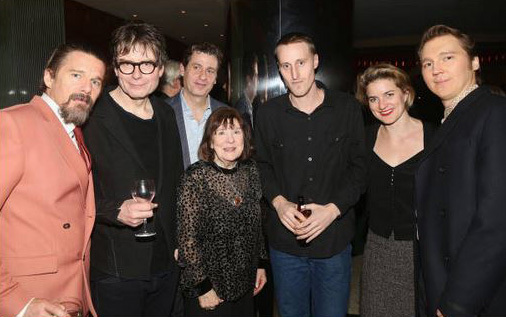 The second photo shows the pair photograhed with the play's director and cast, including Ethan Hawke and Paul Dano. Besides the Broadway revival, "True West" was also staged at London's Vaudeville Theatre from December 4 through February 23. The production, which marks the first U.K. production of a Shepard play since his death, stars "Game of Thrones" star Kit Harington and "Hangmen" alum Johnny Flynn. 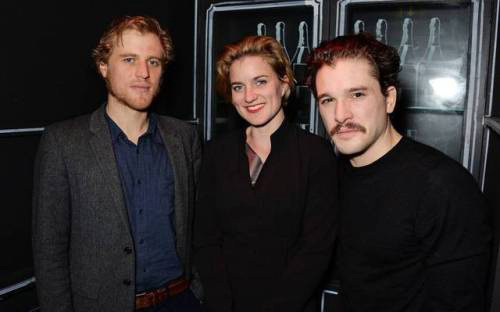 Here's a photo of Sam's daughter Hannah with Harington and Flynn at the after party at the Foundation Bar on December 4th. Last night Ethan Hawke and Paul Dano bowed as brother versus brother in the Broadway revival of TRUE WEST at Roundabout Theatre Company. 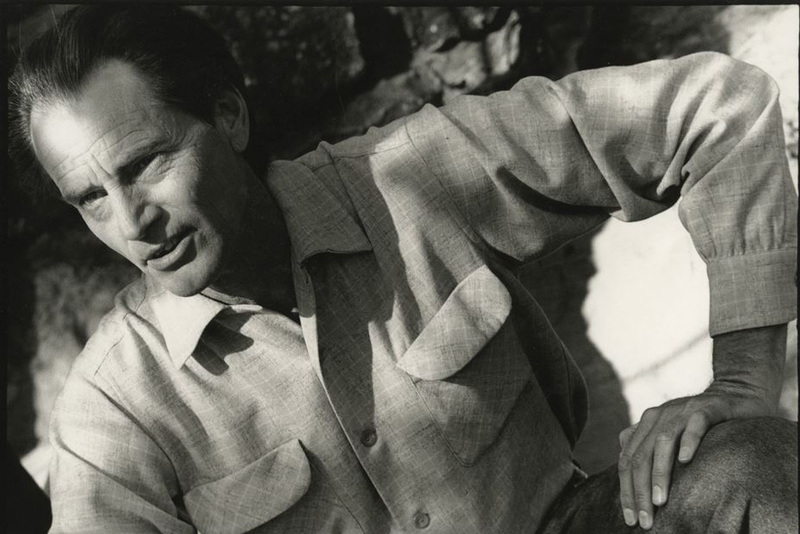 Hawke first saw the play when he was about 14 years old and confessed, "It made me want to be an actor, or be involved in whatever they were doing. So to get the chance to do it now is very meaningful to me." Though Hawke has worked on numerous Shepard plays, he reveres True West. He praises the man with "He is one of the great American poets we've ever had. He had the swagger of a real cowboy and he had the brains to back it up." Alexis Soloski of The Guardian agrees, "Shepard is the great poet of wounded masculinity, of men who would be cowboys if the world would only offer them territories, frontiers, wildernesses. Instead they ride in circles, tearing up their own internal turf." Hawke relates his initial thoughts on the play - "Before Sam died, I had wanted to direct it with women to expose how the female psychology is just as vulnerable to this war. I started working on it with Marin Ireland and Martha Plimpton, and it was amazing! I wish we could do that production, but Sam didn’t want to. Sam’s cut from another cloth. He’s from a different tree in the forest—an older part of the forest! He was utterly baffled by the suggestion!" 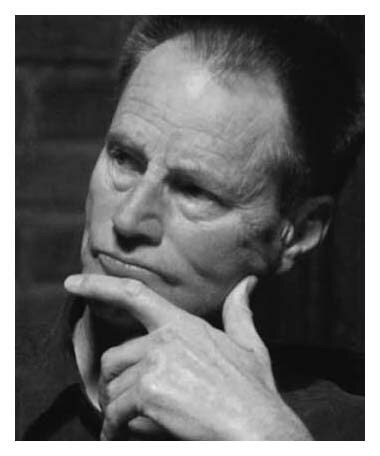 A finalist for the Pulitzer Prize in 1983, True West is arguably Sam Shepard’s funniest play. Directed by James Macdonald, this revival stars Ethan Hawke as Lee and Paul Dano as Austin. I am a great admirer of Ethan Hawke's work but I have to admit the sight of Dano annoys the hell outta me. Truly. Though Hawke is receiving rave reviews, many theater critics are not enthralled with Dano's performance. Robert Hofler of The Wrap writes, "Hawke nails Lee... He is giving the performance of his stage career... Dano has mastered a low-key, naturalistic style of speaking, but Austin is anything but understated in the second act when he challenges his brother for supremacy in their mother’s house, as well as the world beyond. Dano doesn’t make a convincing drunk, which is a real problem for a role that requires his character to be totally smashed for most of the second act. But more serious is his inability to match Hawke’s energy, presence and intensity. Instead of confronting Lee, Dano’s Austin literally flounces. 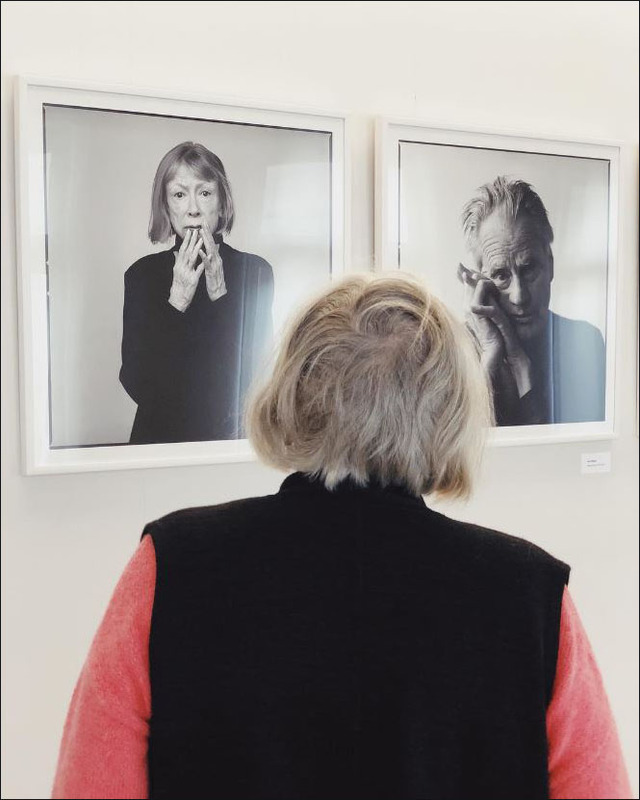 French photographer Brigitte Lacombe included a portrait of Sam among her selected 40 images in her October 2018 exhibit in Bucharest by The Romanian National Theatre Festival. There's a reflection in the second photo showing a visitor taking the photo. I've never seen this portrait obviously taken after he became ill.
A year later, Sam's friend Wim Wenders wrote a short review of "Spy of the First Person". He wrote, "I like short books. 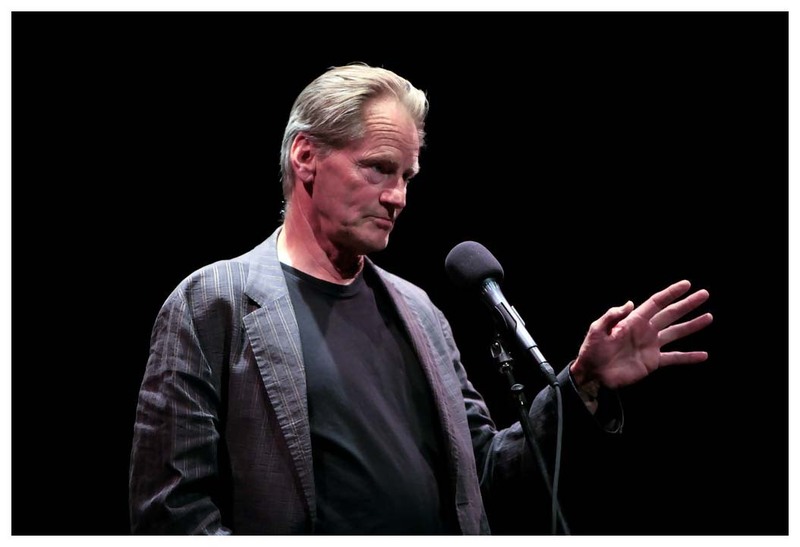 Sam Shepard’s last novel, which he finished with the help of Patti Smith, as he couldn’t type any more himself, is a miniature novel and was published posthumously. It has been my favourite reading lately, and for once I wish it would have been much longer. Actually, I was so addicted I read it again the next night. 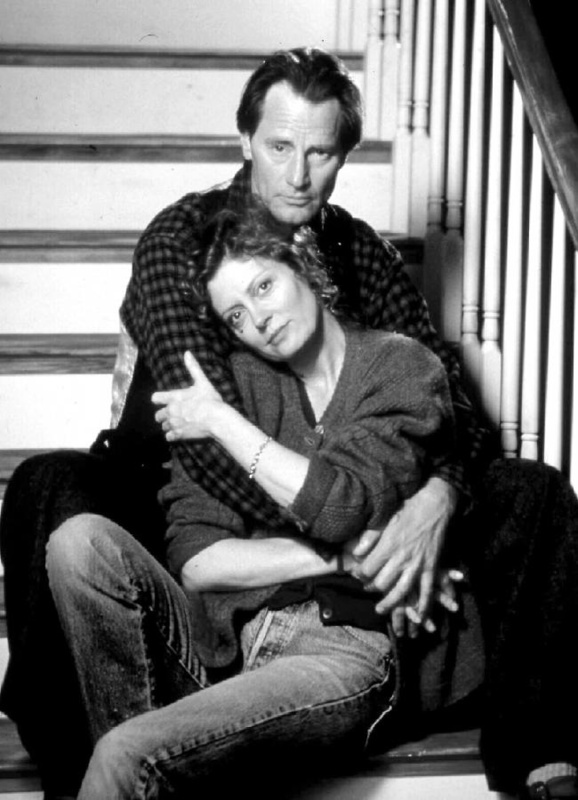 Sam Shepard wrote like nobody else: his prose is sparse, pure and sharp, and his dialogues flow from the pages as if his characters had been recorded live. Yet they talk like no other people; tentatively, hesitantly, always making sure they follow the other’s drift. Sam’s universe, in all its simplicity, reveals a deep understanding of the American soul." 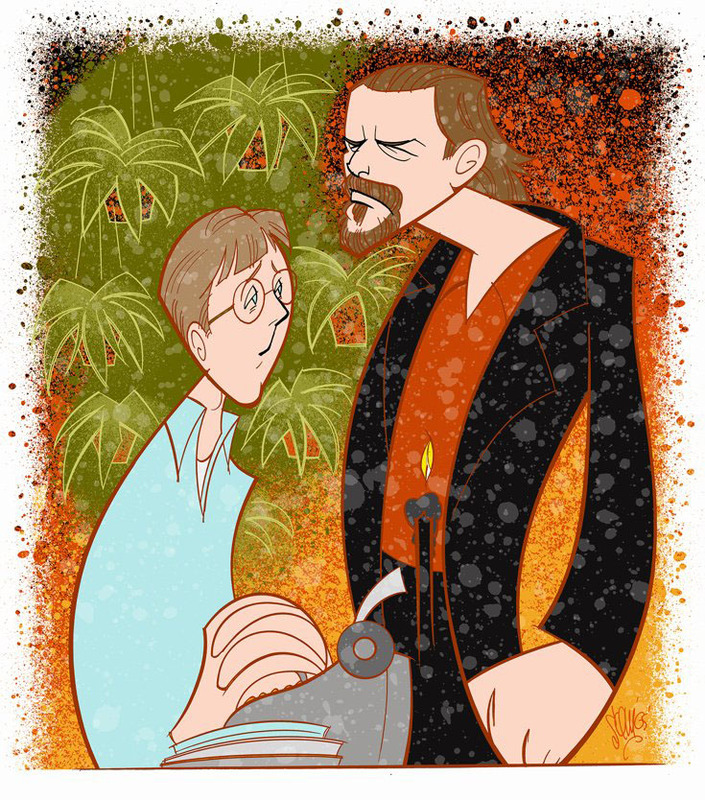 The 1982 New York staging of "True West" starred John Malkovich and Gary Sinise. In a recent interview Malkovich confessed that he didn't know whether Sam had seen the whole play. 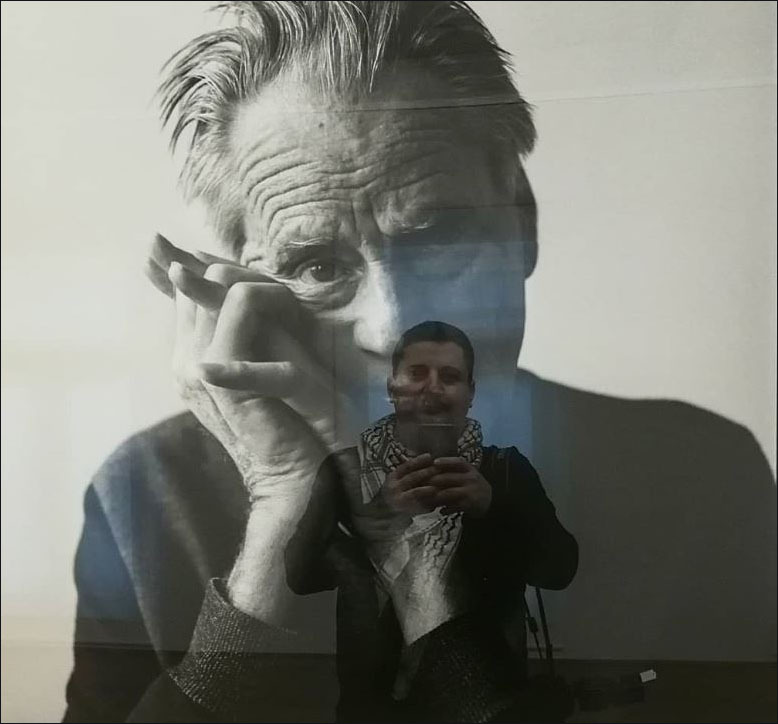 He remembers, "It was at a lovely little theatre in New York, Cherry Lane, and there would be Antonioni or Kurt Vonnegut or Jacqueline Onassis or Bowie - kind of everybody came. But I don't believe I met Sam during the run. Sam wasn't a conventional movie star. He wasn't a conventional anything. He was a real one-off." He adds, "He was very funny, super-laconic. It was no surprise he played cowboys and astronauts. But there was something sweet, lonely and poetic about him too." Another movie page has been completed. 1994 was a banner year for great films and I remember buying a CD for the wonderful movie soundtracks that year. Perhaps that's why "Safe Passage" suffered a bit at the box office. So much competition! The family drama, based on the novel by Ellyn Bach with a screenplay by Deena Goldstone, was headed by Susan Sarandon, one of Hollywood's greatest actresses. I like to think of this film as a valentine for all mothers. This is a feel-good movie that's so heartwarming. I just loved all the dynamics of this wacky family. With so many stories about dysfunctional families, this one was so refreshing and reaffirming. It'll also give you a chance to see Sam play the piano. Our playwright will be celebrated with an afternoon of performances and readings at London's Royal Court Theatre on November 12. Curated by Lloyd Hutchinson, Nancy Meckler and Stephen Rea, the event will feature scenes from Sam's plays and poetry he wrote during his lifetime. A number of his plays were staged at the Royal Court throughout the 1970s and 1980s. Fool For Love, Buried Child and A Lie of the Mind have all recently been revived in London, with a West End production of True West beginning this winter. The event will take place at 3 pm in the Jerwood Theatre Downstairs. All proceeds will go towards supporting emerging playwrights. Flashback: May 22, 1984 - ''Fool for Love'' won the Obie Award for best new American play of the 1983-1984 theater season. Obies for best performance were also presented to the play's leads, Ed Harris and Kathy Baker. The play will be performed during the next month at The Actors Studio in NYC. Performances will run on a Thursday, Friday, Saturday & Monday at 7pm with a Sunday matinee at 3pm from October 18- November 12th.